The “abolish-ICE” left has been trying to pin the migrant girl’s death on the Border Patrol. Now more details are coming out and it looks like she had some type of infection. 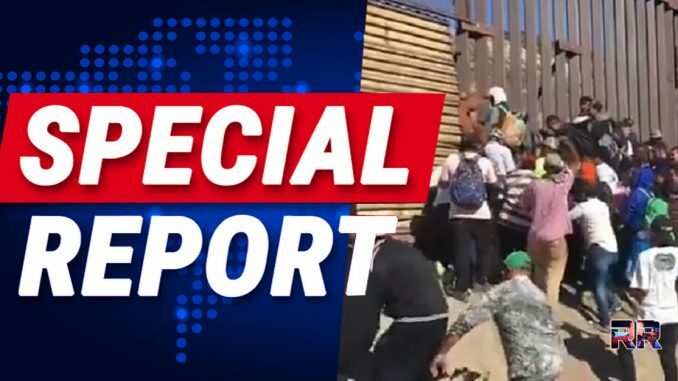 It was reported earlier that one-third of those in the migrant caravan are sick, many with serious diseases. “The seven-year-old Guatemalan girl who died after trekking hundreds of miles with her father before illegally entering the U.S. likely suffered from septic shock, the Department of Homeland Security (DHS) said. Jakelin Caal Maquin died December 8 in a hospital in El Paso, Texas, after being brought there by helicopter. She and her father, Nery Gilberto Caal Cuz, were apprehended by U.S. Custom and Border Patrol (CBP) agents along with 161 others on December 6. When she began vomiting hours later, she was airlifted to the hospital, where she died. Sepsis is an infection in the body that can cause septic shock, which can damage multiple organ systems and cause blood pressure to drop dramatically, leading to death. In the timeline, DHS says the large group of illegal aliens was apprehended at 9:15 p.m. by three CBP agents. They were taken to the Forward Operating Base Bounds in a remote area of New Mexico, adjacent to the Antelope Wells Port of Entry. There, they were broken into groups for transport to the nearest Border Patrol Station in Lordsburg some 90 minutes away. After a bus took a first group of 50 there and returned, Jakelin and her father boarded the bus at 5 a.m. When they arrived at the station, Caal told authorities his daughter was not breathing. CBP emergency medical staff began administering medical care. Sepsis is most common in the very young & old, pregnant women, and “people who have chronic conditions, such as diabetes, kidney or lung disease, or cancer,” and, “people who have weakened immune systems,” according to Mayo. So now it appears the girl was sick prior to reaching the border, like many of the migrants are. The left will have a hard time blaming Border Patrol for that. They actually saved the little girl’s life twice & should be applauded. Share this if you support our men & women in the Border Patrol! They should not have risked life and limb to get here. It’s the cold hearted truth. Guns locked and loaded, and the great state of Texas will secede the union, because we are the only treaty state to have joined, before The New World Order comes to fruition. We will need a very, very large border wall to keep all of America OUT!!!!! Our governor is preparing for this upcoming disaster as I type!!! Better wake up America, because Texas will not be able to save you!